Combining a number of Spectrum M2p, M2i, M3i or M4i PCIe digitizers with a Tera-Store Data Streaming solution allows the capture and storage of long complex signals for extended periods of time. With systems available offering from 1 to 96 TB of storage and streaming rates up to 3 GB/s signals can be digitized and stored seamlessly for hours on end. SPcB8-E6: This powerful computer includes a Supermicro 4U/Tower with 8 drive bays and 6 free PCIe slots for Spectrum cards. The PC is powered by a Xeon Quad Core 3.5 GHz processor, has a passive cooled graphics card, 16 GB RAM, a separate 256 GB SSD for the system installation, a DVD drive, and runs under Windows 10 Professional 64 Bit. The chassis hosts a powerful 865W power supply and has whisper quiet fan-based cooling. SPcB24-E8: This powerful computer includes a Supermicro 4U/Tower with 24 drive bays and 8 to 10 free PCIe slots for Spectrum cards. The PC is powered by a Dual Xeon Octa Core 1.7 GHz processor, has a passive cooled graphics card, 2 x 32 GB RAM, a separate 256 GB SSD for the system installation and runs under Windows 10 Professional 64 Bit. The chassis hosts a powerful redundant 1200W power supply and has powerful fan-based cooling. If more acquisition channels are needed, than can fit into the base PC system, a special 16 slot docking station can be connected to extend the number of synchrnous streaming data acquisition channels up to 256. For large multi-digitizer systems Spectrum also provides Star-Hub, a unique clock and trigger distribution system, which allows all the installed digitizer cards of one family to be clocked synchronously and to share a common trigger. The star-hub is already included in the base system. Storage systems are available offering a range of streaming rates, from 500 MB/s up to 3 GB/s, and storage capacities, from 1 TB to 96 TB. The options consist of a high performance RAID controller and a number of solid-state or hard-disk drives (SSD/HDD’s) configured to support the required transfer rates and storage times. 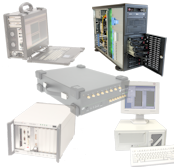 Spectrum integrates the complete system, providing factory configuration and performance testing. This includes the PC setup, software and hardware installation and digitizer calibration. Hardware and software are both optimized and tested to guarantee the specified streaming rates. Be always informed and subscribe to the newsletter here.